Introduction and Description of Pavements. Principles of Mix and Structural Design and Construction of Asphalt Pavement. 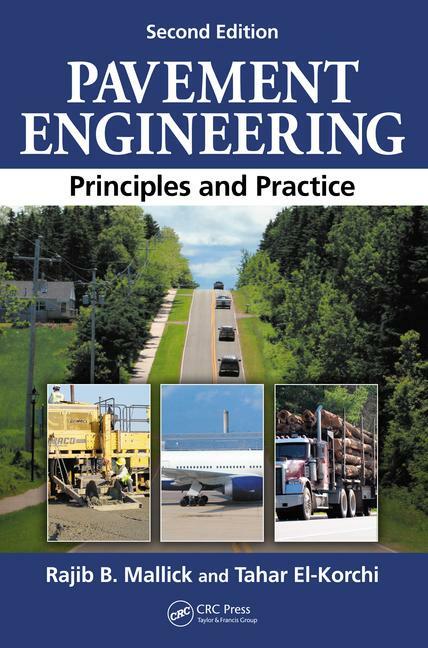 Principles of Structural Design, Mix Design, and Construction of Concrete Pavements. Standards. Traffic. Drainage. Soil. Aggregates for Asphalt and Concrete Mixes. Asphalt and Emulsions. Concrete Fundamentals for Rigid Pavements. Distress and Performance. Consideration of Major Distress Mechanisms and Material Characterization for Asphalt Pavements. Distress Models and Material Characterization for Concrete Pavements. Mix and Structural Design of Asphalt Mix Layers. Mix Design and Structural Design for Concrete Pavements. Construction of Asphalt Pavements. Construction of Concrete Pavements. Maintenance and Rehabilitation of Pavements: Pavement Management Systems. Airport Pavements. Nondestructive Tests. Economic Analysis and Cost-Saving Concepts. Instrumentation in Asphalt and Concrete Pavement. Specialty Applications. Sustainable Pavement Engineering. Environmental Mitigation in Transportation Projects. Conversion Factors. References and Bibliography. Index. Dr. Rajib Mallick, PE, has extensive experience with asphalt materials, mixture design, construction, pavement design, recycling, and nondestructive testing. From 1992 to 1998, he worked as a research assistant and as a senior research associate at the National Center for Asphalt Technology (NCAT) and is currently the Ralph White Family Distinguished Professor of Civil and Environmental Engineering at Worcester Polytechnic Institute (WPI). He has completed numerous research projects for several departments of transportation, the Federal Highway Administration (FHWA), the Massachusetts Port Authority (Massport), the National Science Foundation (NSF), the Federal Aviation Administration (FAA), and several private practitioner organizations. Dr. Mallick has coauthored more than 100 papers for journals and conference proceedings, as well as several practical reports, manuals, and state-of-the-practice reports for federal, state, and local highway agencies. Dr. Tahar El-Korchi is a professor and head of civil and environmental engineering at Worcester Polytechnic Institute. He does research and teaches courses on pavement analysis, design and management, construction materials testing and evaluation, cement and concrete materials and construction processes, structural analysis and design, and high-performance structural materials at the undergraduate and graduate level. He has published more than 80 publications and presentations and has served at numerous WPI global project centers, including Puerto Rico; Washington, District of Columbia; Morocco; Costa Rica; and Panama. Dr. El-Korchi was granted the prestigious Presidential Young Investigator Award by the National Science Foundation in 1991. Dr. El-Korchi is also a consultant to several major corporations. He provides recommendations for the design and evaluation of pavements, materials, and structures.